The article "Transistor power amplifier schematics " describes some solutions used in transistor amplifiers. This article discusses how technical parameters of an amplifier change with some more complex modifications that are brought into the basic schematics. All schematics are simulated with Electronics WorkBench (EWB) and are not for mechanical implementation in reality. In all amps the same transistors are used and the same quiescent currents in similar stages (if possible). 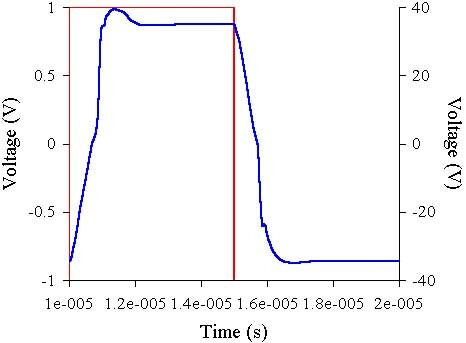 What happens when the output stage quiescent bias current is changed is described in: "The influence of quiescent bias current of the output stage on the amplifier parameters ". EWB does a "small-signal distortion analysis" of the circuit, but I don't know how "small-signal" amplitude is determined, so the absolute values of the second and third harmonics graphs should be treated as qualitative results. 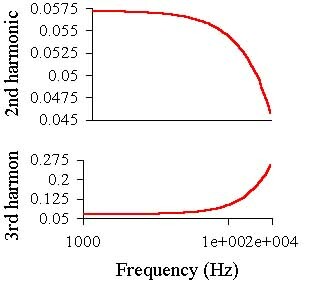 Special article is about calculations needed for designing Your amplifier: "The example of amplifier design calculations". One shouldn't think that having no comp and SPICE simulation programs like EWB nothing can be done in electronics. Using engineering calculator I can make DC calculations of an amp in half an hour, without calculator - in 40 minutes but with less accuracy (though EWB does it in milliseconds). All schematics use those transistors, SPICE models of which I have, but such transistors can be used in real projects, though many other BJT's can be used. As a matter of fact using "the right" transistors can give a lot. 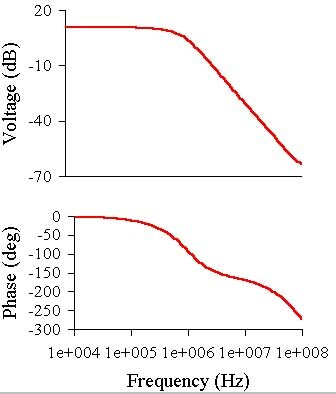 For instance the old scheme with new transistors can have better characteristics, using transistors with higher transition frequencies can make amp more stable (and less stable too!) and so on, but I can not cower all questions. As I can not cover all questions, the same type of output stage on complementary two stage emitter-folower (Darlington) is shown everywhere, though triples and feedback followers are posiible. Triples are almost not used now because in old times power transistors with H21e=5-10 were possible and those used here have H21e more than 50. Using complementary feedback output gives lower distortions, lower saturation voltages though You can not put the two transistors of a pair on the same heat sink without insulation substrate but this is not our theme. All schemes are non-inverting, inverting amps are not considered here, though such amps have some advantages. All schemes have DC servo, though it's use is not justified in simple schemes just because of its cost. For biassing output stage the same voltage source ("transistor Zener diode") is used, only resistor with selected value is used instead of potentiometer (which should be used in real devices). Output transistors quiescent bias current is the same (about 150 mA). Some of these schematics are relatively unstable (generate on some types of signals), but these are virtual schematics and so it is not so bad: the task of gaining stability has to be solved when You design your schematics on concrete transistors. Still I used frequency compensation capacitors and resistors to achieve maximum stability and provide absence of generation. 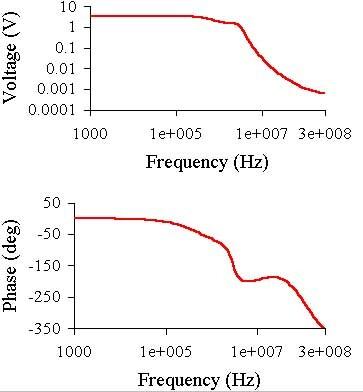 The transient is obtained by making 100 kHz 1V meander input signal. Every subsequent scheme is a result of evolution of the previous one or some of the previous. For obviousness amplification factor of all schemes with negative feedback (NFB) is 100/3+1=34.33. The power supply voltages are +_50V everywhere. Sometimes pictures of function generator or oscilloscope are present on schematic diagrams: I simply had no time to remove them. The images of names and values of components are shown as they are generated by different versions of EWB, so they can differ on some diagrams on other pages. The numbers of elements are not in order, some numbers are omitted, but to make proper a dozen of schematic diagrams I had to spent an unpaid week which I didn't have. With the resistor values shown the first (differential) stage quiescent current is 3.98 mA, second (voltage amplifier) stage - 16.2 mA, output transistors quiescent current is 114 mA. The first stage current is slightly more than usual in such schemes (1-2 mA), the second stage current is a bit lower than that in the following schemes. I simply had no patience to make it the same. 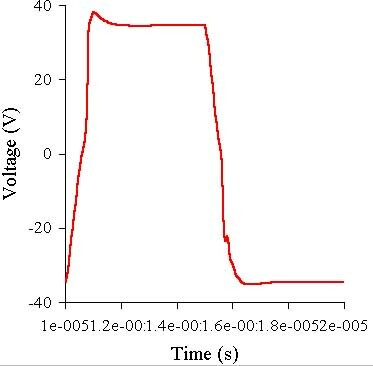 The output stage of emitter follower has lower quiescent current than that in the following schemes but when I tried to make it 150 mA EWB V5.0 showed "general error" and I had no V5.12 at that time. The scheme differs from the old ones by small input pair degeneration emitter resistors and such resistor in the emitter circuit of Q15 - the voltage amplifier of the second stage. Without such resistors the amplification factor without NFB at low frequency (1 kHz)would be higher and low frequency distortions - lower. 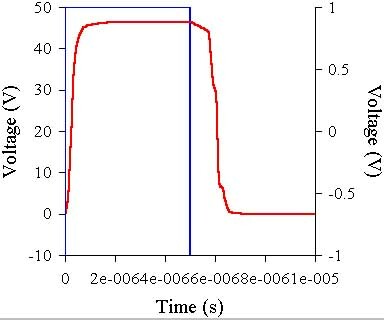 Blue - input signal, red - output (and further always so). Below only "red" graph is shown because the input is always the same. R.m.s. 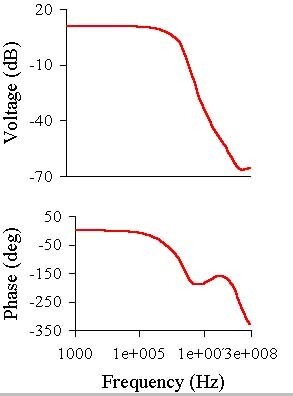 sine voltage during frequency analysis is 10 mV, amplitude of square impulse is 1 V, it's so in other cases. 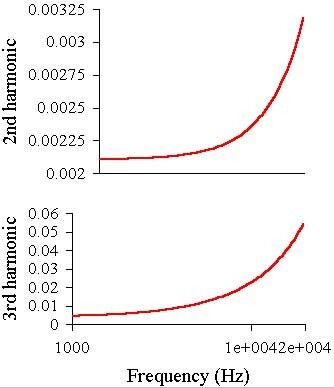 Strange nature of the second harmonic - it descends with frequency growth - must not confuse: after 20 kHz it begins to grow. 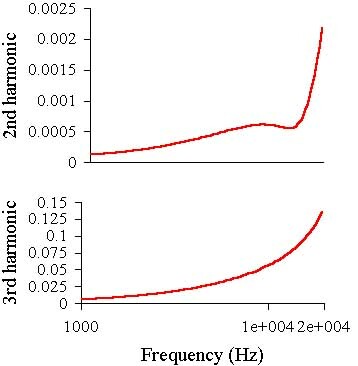 At the starting frequency (1 kHz) the value of both harmonics is about 0.05. 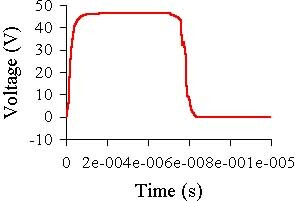 The amp is absolutely stable (at resistive loads). This can be achieved with two compensation capacitors: C3 and the lead compensation -C5. Usually only the first is present but using both or lead compensation makes it possible to make higher the open loop gain at sound frequencies. But obtaining of optimum compensation is not our task now. And in the end here are the DC operating point (voltages in all nodes of the scheme, which are shown as numbers in rectangles. Using these voltages humanoid knowing Ohm's law can determine currents in all branches. 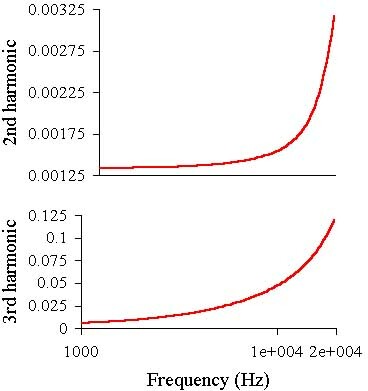 In comparison with the previous scheme this one provides lower THD at higher amplitudes and higher gain, that makes it possible to increase the feedback factor and correspondingly decrease THD. Do not be afraid of the 3 kOhm resistor at the input (R11) - this is done for the easier balance of the amplifier. If th DC servo is not used a capacitor should be put between R35 and ground and input resistor R11 should be equal to R34=100k. With the resistor values shown the first (differential) stage quiescent current is 3.98 mA, second (voltage amplifier) stage - 23.6 mA, output transistors quiescent current is 140.5 mA. 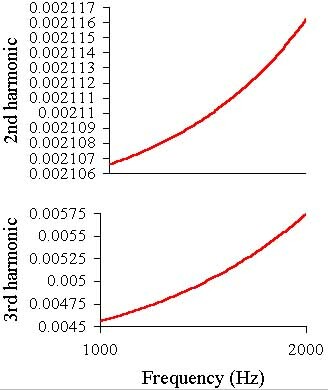 Then the second and third harmonics graphs in the 1 kHz - 20 kHz range. The scheme is stable, only one capacitor of the lead correction can be used. 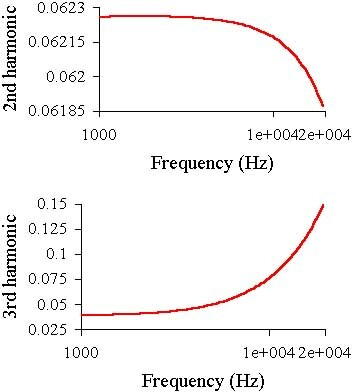 The level of the third harmonic at low frequency is almost 10 times lower than in the previous case, and this is achieved by introduction of a single transistor: Q16. In comparison with the previous scheme this one provides higher open loop gain, that makes it possible to increase the feedback factor and correspondingly decrease THD. With the resistor values shown the first stage quiescent current is 3.98 mA, second (voltage amplifier) stage - 23.57 mA, output transistors quiescent current is 141.5 mA. That is almost the same as in the previous case. Then the second and third harmonics graphs in the 1 kHz - 20 kHz band. The amplifier is stable but the frequency compensation is provided by a rather large capacitor C3 (larger than in previous case). The small signal distortion level is approximately the same as in the previous case, but if the resistor values and currents are optimized the amp shows lower distortions at low frequencies. 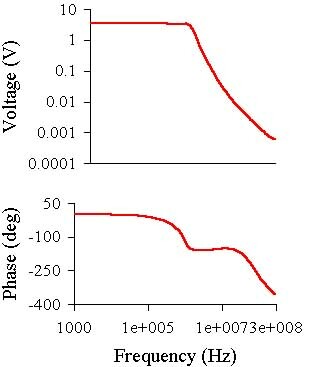 Better results can be achieved if a higher H21e transistor is used as Q15. With the resistor values shown the first stage quiescent current is 2.38 mA, second (voltage amplifier) stage - 21.76 mA, output transistors quiescent current is 140.45 mA. The stability is achieved only with the use of new RC circuit (R24C8), but still the square impulse shows small pip after the front. Such frequency compensation is usual in the three stage voltage amplifiers but here no simple solution could be found. The distortions level is much lower than in the previous case and it is strongly dependent from frequency. 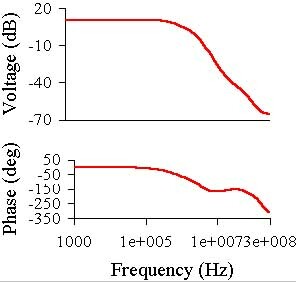 So to see the distortions at low frequency the graphs are shown in the 1-2 kHz range. As one can see the simple innovation gave outstanding result. 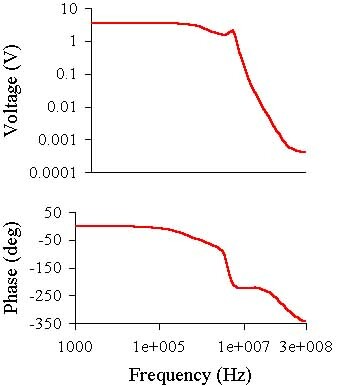 Although if in the previous amp better H21e transistors than MJE340-350 were used the result would not be as radical. We have to pay for new emitter-follower introduction by stability, but nothing could be done. 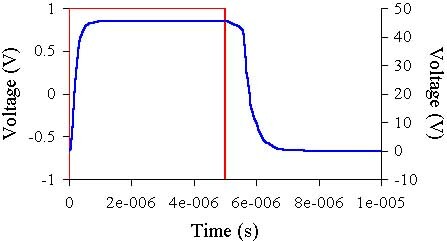 The obtained result is explained by substantial increase of the first stage gain because it works with higher load resistance. Thus the gain begins to decrease at lower frequency which lays within the sound frequency band (20 Hz - 20 kHz) which is not very good. 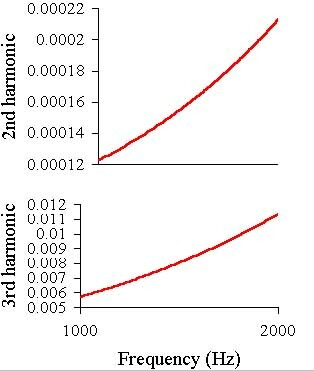 So at 20 kHz the third harmonic is not much less than before. So if higher frequency transistors can not be used the gain can even be made lower using local feedbacks. The low frequency distortions will be higher but they will begin to grow at higher frequencies. Cascode gives better slew rate not changing the gain. But it makes it possible to use low voltage high-"beta" transistor as the first in the pair (Q6) thus making it's input resistance and the first stage gain higher. With the resistor values shown the first stage quiescent current is 2.38 mA, second (voltage amplifier) stage - 24.2 mA, output transistors quiescent current is 149 mA. That is almost the same as in the previous case. The stability is achieved only with the use of new compensation circuit in the first stage, but still the square impulse shows a all pip after the front. 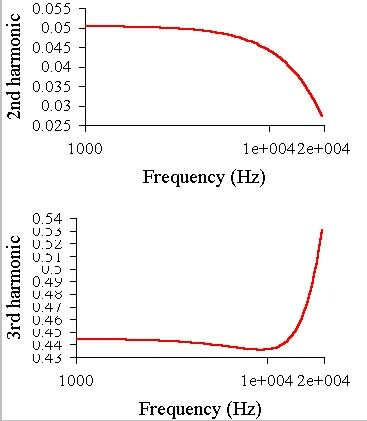 As it can be seen the level of the second and third harmonics is rather low at the low frequencies, but it is higher than in the previous case and at 20 kHz it is the same, which means that the open loop gain begins to decrease at higher frequency and a slightly lower open loop gain at low frequency. From the square impulse "oscillogram" its hard to see the slew rate growth, but it can be twice as high as in the previous amp. Cascode gives better slew rate not changing the gain. Such solution is rarely used in the first stage, because it brings complication but with little gain: the input stage works in a small signal mode. But in that way we can use low voltage low noise transistors if we have no BC546-556 type. The Q19, Q21 can be general purpose transistors. With the resistor values shown the first stage quiescent current is 3,2 mA second (voltage amplifier) stage - 24.2 mA, output transistors quiescent current is 148 mA. That is almost the same as in the previous case except the first stage. The amp is more stable than the two previous ones. The C2 capacitor is small, but still the square impulse shows a pip after the front. 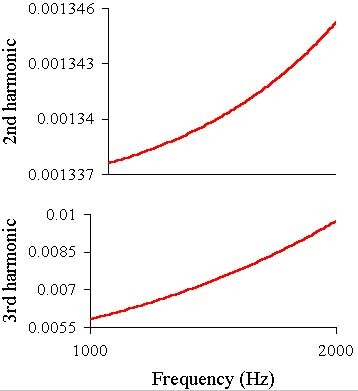 As can be seen the second and third harmonics levels are about the same as as in previous case at low frequencies, and at 20 kHz they are better than in all described schematics. This is because of the wider open loop frequency range. 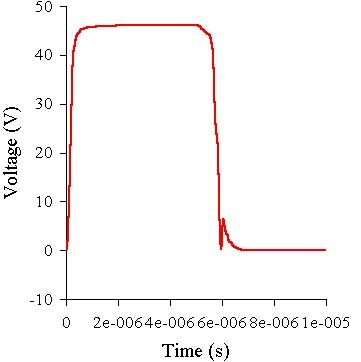 The square impulse shows higher slew rate of th amp. And in conclusion it must be mentioned that the hybrid schematics with emitter-follower and cascode in the second stage is possible, but I do not examine it here. The second part is about symmetrical schematics. The article is divided in two parts simply to make each part smaller: this part is still 500 kB large.